If you think San Diego cannot produce stunning fall color, think again! With the right mix of plants, you can enjoy beautiful fall foliage in lovely yellows, oranges and reds that will remind you of fall much farther north. You do not have to travel to northern California or New England to see beautiful fall color when you choose the right plantings in your own yard! Juniper Landscape Company will help you choose, plant and maintain your yard to include lovely fall colors as well as blooms throughout the year. What Fall Color Plants Do Well In San Diego? When you choose plants for fall color, it is important to think in terms of space. For example, many trees and shrubs provide great color but take up a lot of room. If you have a very small yard, it is not a good idea to choose a plant that will grow large. Instead, choose a smaller hybrid version of the plant or a different type of plant altogether. Here are some great fall color plants in all sizes that will brighten your yard, no matter what its size! Black Oak. This large tree offers beautiful deep yellow as its leaves begin to change in the fall. The tree itself grows to huge heights and has an extensive root system, so it is very important to have plenty of space if you choose this variety. Virginia Creeper. This vine is one of the most ubiquitous of all plants and can grow practically anywhere. It turns a beautiful red before the leaves begin to fall in autumn; in fact, many consider it a great barometer of coming cooler weather. Train it up a trellis in almost any location, but be sure to keep it cut back and under control as it can take over your yard quickly. Chinese Pistache. Red, gold and yellow vie for attention in this incredible tree. It grows smaller than oaks and other large trees so it may be suitable for a smaller yard. Spirea Goldflame. Enjoy this low-growing bush near your home or in large plantings in your yard. This variety changes to a flaming gold in autumn to brighten your space with color. No matter what type of fall color you want in your yard, Juniper Landscape Company can help. 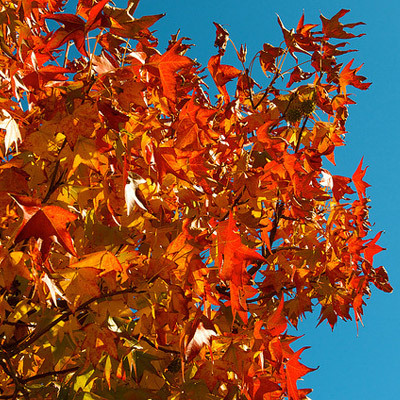 Our professional San Diego landscapers will help you choose the right plants for a beautiful fall look.